Many claim the new Halloween Black Whopper sold at Burger King is causing them to have green-colored poop. LOS ANGELES -- The bun on Burger King's new Halloween Whopper might be black, but it'll have you seeing green on the other side of that experience. Reports have surfaced that the black burger bun, which was a hit with Japanese consumers last year, will stir your stomach to create a green bowel movement, with shades ranging from neon to hunter green. Call it curiosity -- a staffer with our sister station KTRK in Houston decided to try it. "I noticed flecks of green in the bun itself," our colleague said. "I wondered if it was mold but for the sake of science, couldn't stop myself." The end result: "Yep, it came out Frankenstein green." Meteorologist Don Schwenneker at our sister station WTVD also said the Halloween burger left him feeling "haunted." "I ate this one and for two days was haunted by the color green," Schwenneker said on his Facebook page. 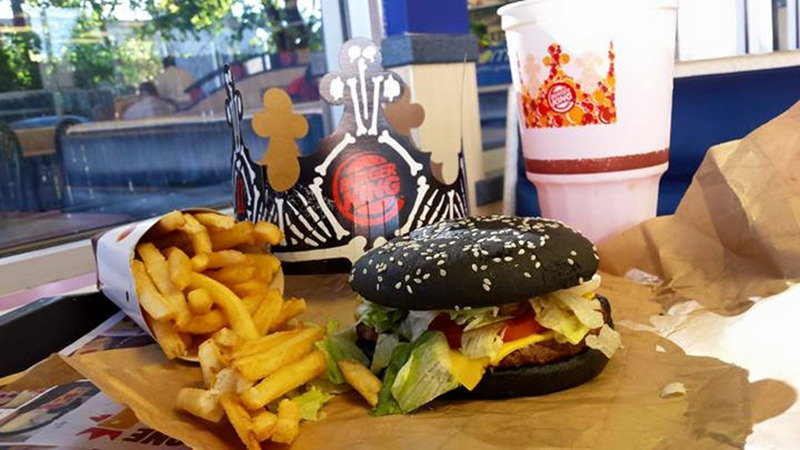 Burger King tells ABC News the dark bun's color comes from the "smoky black pepper flavor of A.1. baked into the bun," and that it contains less than one percent food dye. The concentration of food dye in the bun meets Acceptable Daily Intake measurements approved by the Food and Drug Administration, the company says. Burger King did not immediately respond to our request for comment on the green poop claims.